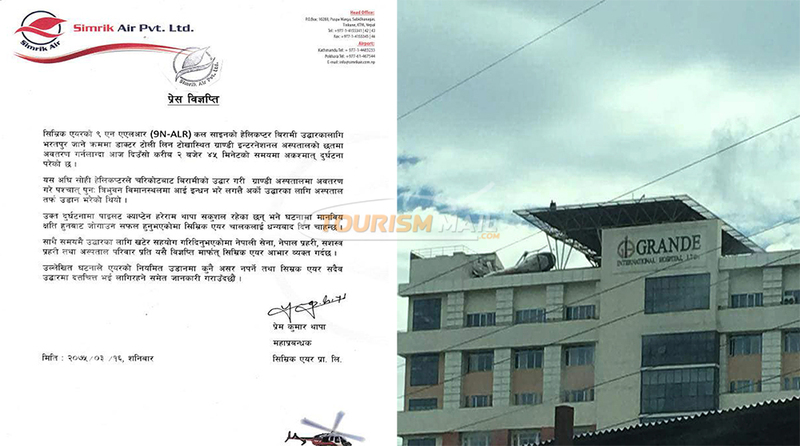 KATHMANDU, July 01: Simrik Air has released a statement regarding the crash of one of its helicopters at the roof of Grande Hospital on Saturday. The helicopter, with the call sign 9N-ALR, had crashed at the rooftop helipad of Grande Hospital at Tokha while attempting to land at around 2:45 pm. There were no casualties during the crash as the helicopter fell 10 feet from the helipad onto the roof of the hospital. The statement by Simrik Air stated that the helicopter had previously airlifted a patient from Charikot, and refueled at Tribhuvan International Airport before coming back to the hospital to pick up a medical team for another rescue at Bharatpur, Chitwan. The press release also thanked pilot in command Captain Hareram Thapa for preventing a larger incident, and further expressed gratitude to the Nepal Army, Nepal Police, Armed Police Force, and the hospital team for support and timely rescue after the accident. It further went on to assure that Simrik Air will continue normal operations and shall not be halted due to the incident.